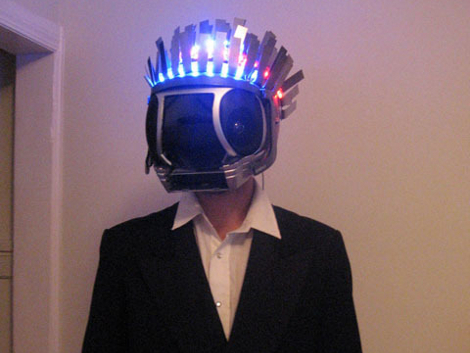 [Dr. West] shared his Halloween costume with us; a Daft Punk inspired voice-changing helmet. He stared with a motorcycle helmet, cutting out a hole in the back for a sub-woofer speaker. Inside there’s an old computer mic and the amp circuitry for a portable stereo system. 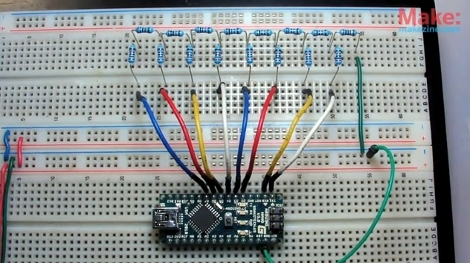 An Arduino is used to pick up the wearer’s voice from the microphone and perform the digital signal processing. Once the alterations have been made the signal is sent to an R-2R resistor ladder to perform the digital to analog conversion, and onto the amp for broadcast. Hear the result in the video after the break. The rest of the helmet is window dressing. He found some kind of auto-body repair product called flex-edging to use as metallic hair. Those fins are accented with strings of red and blue LEDs. The faceplate finishes the look using speakers from the stereo system and a tinted visor. He wan’t going for a replica, but we think his creation would be right at home with the look of the original.